Our guest is Eric Spinner, certified nutritionist, shiatsu practitioner and owner of Health Haven II in beautiful Medford, New Jersey. The topic of health and wellness is filled with conversations that usually focus on supplements, herbs, organic foods, vitamins, minerals, etc. But there are two essential aspects of health and vitality that are often overlooked. CLEAN AIR and CLEAN WATER. Most of us are walking around in a state of dehydration and we don’t even know it. Proper hydration is essential for the removal of toxins, efficient digestion, and overall function. It is the easiest of all detoxing techniques and the most overlooked. And while “breathing” seems like a no-brainer (no breathing for a few minutes can mean no life! ), the quality of the air we breath, like water consumption, is easy to overlook. Whatever you “smell” is soon inside of you, be it the fragrance of a flower, or the aroma of an orange, or the exhaust from the truck ahead of you when you are driving. It’s a fact of life that our water and air isn’t as clean as it should be. But fortunately, there are things we can do about the water we personally drink and the air quality in our immediate environment. Eric and I will be discussing easy solutions and products that can make a difference. Eric Spinner has been in the health and wellness field for over 20 years and his Health Haven II store is in it’s 20th year! Have your pencil and pad handy as you will want to take notes! 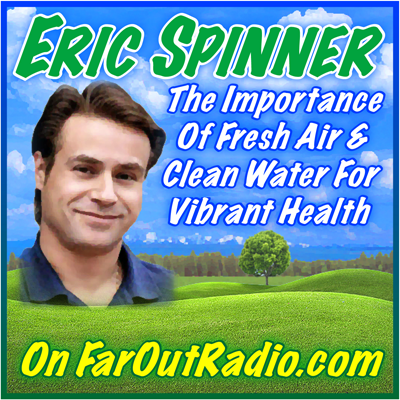 To visit Eric Spinner’s air and water purifier products, CLICK HERE. Listen to the archived show for FREE by clicking the “Listen To The Archived Show” button below. Click Here to Listen to Archived Show, FREE. Designed by Scott and Karen Teeters.